Ministry of Propaganda - 27/Feb/2006: "Bruichladdich 92%"
With a lot of blogs picking up on the Bruichladdich story I thought about not blogging this one. But then again it's an Isle of Islay topic so I have no choice but blogging it. 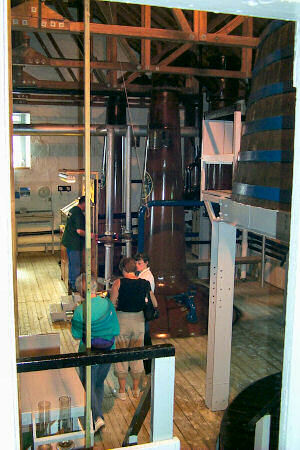 Bruichladdich distillery has today distilled a whisky with 92% alcohol content. Considering that whisky is usually sold at around 40% to 46% alcohol and even a cask strength usually only reaches around 60% alcohol (At distillation it would have been around 70%, I'll let you search for 'Angels share' to understand the difference) this is obviously quite big news. The press picks up on it, the Sunday Herald has some further information and a few comments from Mark Reynier about usquebaugh-baul while The Scotsman seems to mix up proof and alcohol content. Some German blogs are impressed as well. As long as it spurs them on to visit Islay (hint: There's a walking week in April, an excellent opportunity to combine some walking with visits to Islay's eight distilleries) I'm happy. For those who'd like to see where the feat was completed I've included a few pictures on the right. They are from a visit in 2001 but not much has changed since then. 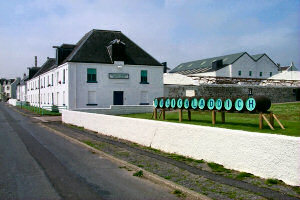 First a view of the distillery when approaching from the north-east, coming into Bruichladdich from Bridgend. Quite a nice touch with the casks spelling out Bruichladdich. The building on the front right now has a roof and houses the bottling hall. Next the still house during a distillery tour, it was quite hot in there as they were distilling when I went on the tour. 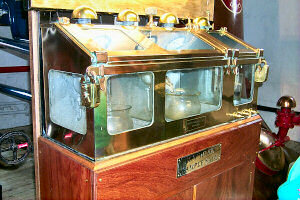 And finally a view of the spirit safe, if you look closely you can see the clear whisky running. I don't think I will buy any of this whisky, however, I'm looking forward to my Octomore of which I bought Octomore futures in April 2005. It won't be ready until 2010 earliest, more likely 2012 or later.